The carcass of Scotland's Six Nations Championship has long been ravaged by the barbed talons of scrutiny and critique. It was a tournament that began with tentative hope and concluded, as it has done with brutal regularity, with a wave of anguish and embarrassment. The temptation now, as the World Cup preamble judders into being, is to scour and scavenge the bones for any scraps that still lurk. In that respect, Adam Ashe, the rambunctious young Glasgow back-row, threw a morsel or two the way of the cosily-assembled press corps quizzing him this week. He did not break ranks - far from it - but his was a poignant insight into the psyche of last season's winless Scots. No-one faulted them for a dearth of heart, pride or ambition, though that did not stop "character" being thrown around press conferences as the buzzword confetti of the Murrayfield regime. Why, when a heavily Scottish, Pro12-conquering Glasgow can dismantle the Munsters, Ospreys and Baths of the UK and beyond do the national team fail against similar opponents? What is it about the thistle and its aura that invokes regression and error as their rivals elevate themselves on the Test stage? "I feel like in the autumn last year we did step up, the same sort of feeling we'd had from Glasgow, winning first eight-ten games of the season," he said, referencing a November Test trio that featured impressive wins over Argentina and Tonga, and a narrow loss to New Zealand. "We came here and it was the same kind of thing; we had that winning feeling about us. "I don't really know what happened in the Six Nations but there certainly wasn't as much of that feeling. It was a bit more edgy, everyone was getting on each other's toes a bit more. "I'd say the feeling has sort of come back a little bit after winning the league with Glasgow. We've all started to believe we're good enough to be up there with the best teams and beat the likes of Ireland or England." Ashe is just 22, emerging with distinction from a furious 14-month baptism of fire, beginning with a Test debut in June before he had played a game for the Warriors against the might of the Springboks. He is one of a new breed of rising Scots - hailing not from a traditional rugby stronghold, Alloa in his case, nor saddled with the baggage of past failures. "It's tricky to put the finger on exactly what it was, but the only thing we can do individually is look at it the same way we look at games for Glasgow and training for Glasgow," he continued. "It does create a little bit of uncertainty in the team. For me, that's the only thing I can look at, why it maybe spiralled, losing the first couple of games and before we knew it we lost five. "The players need to do their own thing well, and if everyone's not doing that, the team's going to suffer." Ashe is no stranger to introspection. He likes his routine - the same pre-match meal gets scoffed, the same boot goes on first. As far as rectifying the mental lapses so starkly out of keeping with Scotland head coach Vern Cotter's nature goes, things have taken something of an old-school turn in training, including the brief introduction of a hostage negotiator to strengthen Scottish resolve. "Vern's put us under a lot of pressure," Ashe attested. "We've had quite a few training sessions out there where we've maybe made a mistake, then a couple of minutes later made another mistake. "He's been like, 'look, we're doing 20 line-outs and I want you to win 85% of them, and if you don't we're not finishing'. Things like that have helped. "Vern's brought guys in to have talks with the team, but it's nothing in much detail. Individually, guys do that thing away from rugby. "Personally I use a sports psychologist, but that's away from here. It's impartial, you can speak to him. Since about 16 I've used a psychologist to work on techniques to get over mistakes, preparation, all that kind of thing. "I think it's a really good thing - speaking to someone who's totally impartial, away from rugby, I find it really beneficial." 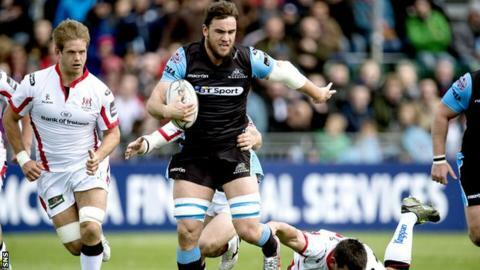 Things took a sour turn at the end of the season as Glasgow head coach Gregor Townsend opted to leave Ashe out of his matchday 23 for the Pro12 showpiece, the tremendous victory over Munster in the final. Three months on, with back-row slots at a premium, he could find himself missing out again as club-mate Josh Strauss - a strong contender for the World Cup when his three-year residency is complete next month - and Dave Denton of Edinburgh are favourites for the number eight slots. Denton in particular showed plenty of the carrying ballast and brutality Cotter demands in last week's loss to Ireland. The onus rests on Ashe to match his counterpart as Scotland travel to Turin this weekend to tackle Italy in the second of four warm-up fixtures. "It was a tough time [being left out of the final squad against Munster] - I had a couple of weeks off after that so I had time to take my mind off it and have a think about what I wanted," he adds. "I'm the youngest out the three number eights. [They are] two highly experienced players. It's going to be tough but we can only control what we can do ourselves. "You're probably going to have to have a couple of good performances; anyone can play one good game, it's if you can back it up."